Today, people around the world are learning that the best Star Wars movie of them all — Episode V: The Empire Strikes Back — was not directed by George Lucas. 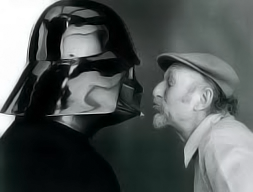 Unfortunately, they’re learning it for the worst of reasons; its actual director, Irvin Kershner, has passed away at 87. Kershner was one hell of a director; beyond Empire, he was best known for directing RoboCop 2 and one of the best Bond flicks of all time. I know it has become a bit cliche to say “May The Force Be With You” when anyone in the Star Wars Crew-niverse passes on — but if there’s anyone that the Force is with, it’s Kershner. Raise a glass of Bantha milk tonight, folks.